So I’ve been really thinking about the whole women being like pure gold thing, since I heard that sermon. The more I think about it, the more I realize just how powerful we are. When you look throughout history, you see just how much gold has had such a huge influence on people. Do you realize that people have left their livelihoods to go on a lifelong pursuit of it? Do you understand that nations have gone to war to acquire it? Do you know that kingdoms have met their demise because they lacked it? Even today, gold still holds weight. It’s easy to forget that we still use gold and that the money we barter with, is only a representation of the gold that’s held in the Federal Reserve. Without gold backing it up, the paper money we use is worthless. With that in mind, do you realize your worth and what you will do/are doing for your husband? Your life and influence will add value to everything he does and every transaction he makes. Your presence will determine whether or not he can walk into a board room and sign multi-million dollar contracts. Your life dictates whether he will be mediocre or excellent. Your influence on him will decide whether his calling in life will become a global one. Ever heard of the saying that men are the “king of the castle”? Well, you serve as proof and verification of your husband’s kingship. When the three wise men brought gifts to Jesus, one of those gifts was gold. This gold was a symbol of the King that He was destined to be. In the same way, when your husband receives you, it will verify to him and others that he is a king fit to have rulership and dominion over many great things. He may already have a powerful anointing on his life, but you are what verifies that anointing. People will see you and know that his anointing is real. They will allow him access to opportunities and places because you serve as the proof that he is worthy of those things. With all of that being said, you are so powerful, even in your delicacy and feminine beauty. Your essence is so alluring and captivating that you don’t have to be tough and hard like iron to influence people, especially your husband. Your husband will see you and know exactly what you are and the value that you hold in his life. He will hear your soft words and watch your gentle actions and will be moved and convicted to do things on your behalf and on the behalf of others, that no amount of nagging, arguing or forcing can do. Recognize your power and know that God created you to be just like gold- soft and delicate, yet incredibly powerful and influential. A few Sundays ago, the sermon at church touched on how husband and wives should treat each other. The message pulled from 1 Peter 3:6-7. Verse 7 says that husbands should treat wives with care because women are the weaker vessel. This verse has been used to “keep women in their place” and to demean us. It has been used justify the abuse, exploitation and mistreatment of women, because as this verse says, we’re weaker and clearly that means we’re deficient. Clearly this verse shows that we’re less than men, right? Well, maybe not. Maybe this verse has been misinterpreted and misused time and time again. The sermon I heard focused on reinterpreting this often misused verse. In the Old Testament days, the priest was the only one who could handle items used during religious ceremonies. This wasn’t only because the items were holy and sanctified, but it was also because they were often made from pure gold. Pure gold, that hasn’t been mixed with other metals to harden, is very soft and if it isn’t handled with the utmost care it will become damaged and bent out of shape. As women, we are like the pure gold used in those ceremonies. Our weakness is not a flaw. It’s an attribute of our God-given purity and delicate beauty. Our hearts and souls can’t withstand being handled roughly by those who don’t take the time to care for us. That’s why we often feel so broken and bent out of shape when we’re in relationships with men who don’t know how to care for us. And that’s also why we’re supposed to wait to receive our husbands. Just like the priest was the only one who could handle those pure gold items, our husbands are the only ones equipped to handle us with God’s tender love and care. So whether you’ve already received your husband, or if you’re like me, and you’re still preparing to receive your husband, I really think this is something that gives so much insight and understanding on what to expect from a husband. Yes, your husband is the leader, but how he uses that leadership role is sooo important. His God-given duty is to treat you with kindness and care because he sees the value in you. He realizes that, just like pure gold, you are priceless and deserve to be treated as such. 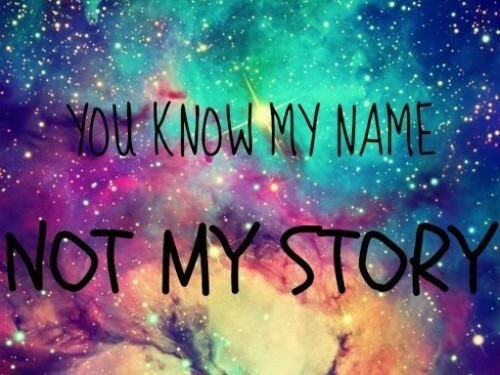 Stop letting people who only know your name make you feel bad about your story. People are going to talk about you until the day that you die. They will lie on you, judge, and assume things about you. They will gossip and start rumors about you. They will criticize and hate on every move you make. There’s absolutely nothing you can do to change that, but don’t you dare let what others have to say change the way you feel about yourself or your story. At the end of the day, the only ones that know your full story are you and God, so don’t give people, who don’t even know the story , the power to make you change it.